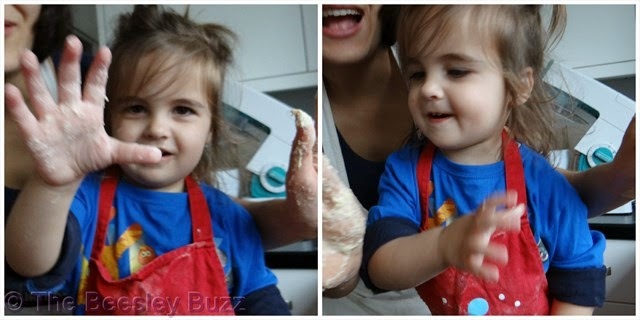 Kids in the Kitchen: More savvy cooking! 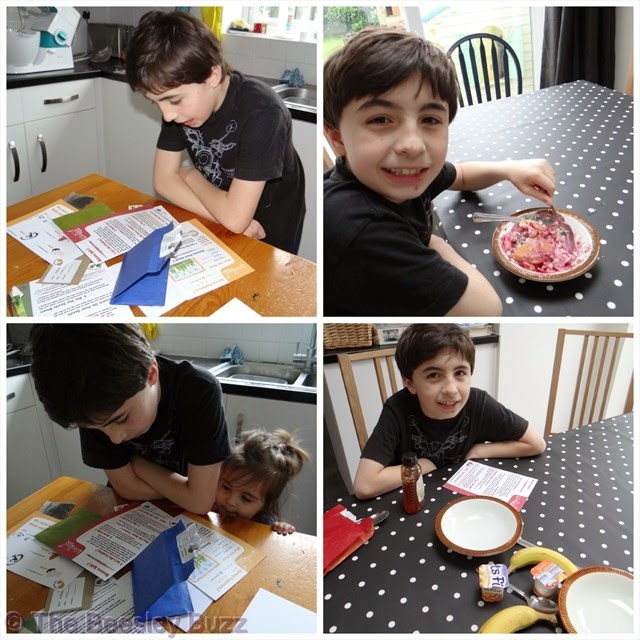 I'm afraid I'm going to point you to our Nectar Savvy blog for another bit of Kids in the Kitchen cooking this week - but I promise it's the last time I'll send you over there for cooking because we've now come to the end of our Sainsbury's Basics Cookery challenge. And we got a bit silly in the kitchen with Miranda-style Vegepals! But don't worry, there was still no food wastage - You can find out the fate of our Vegepal friends here. 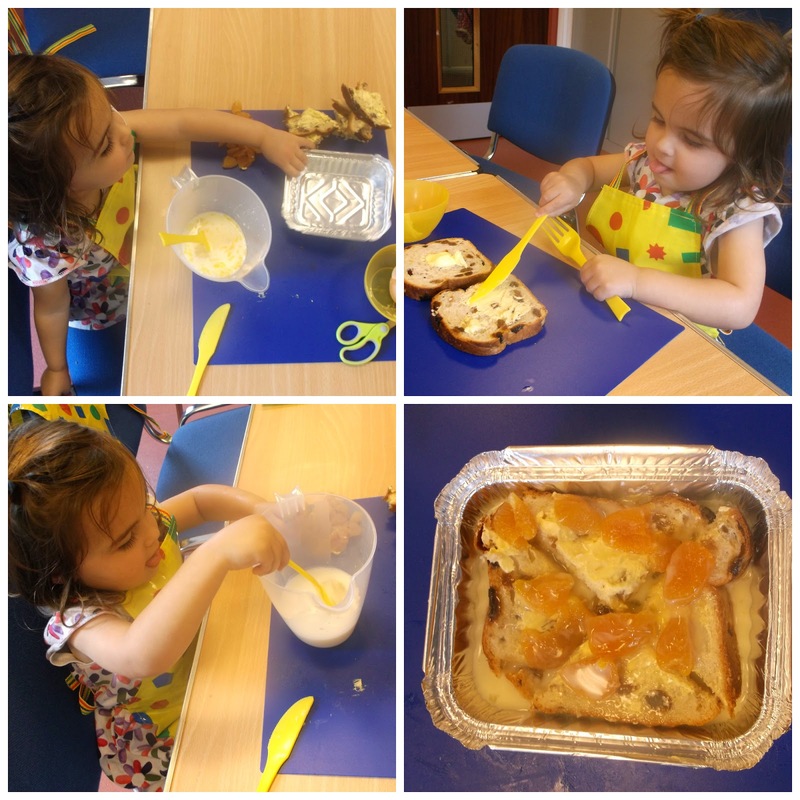 So whilst our cooking in the kitchen can be found over there this week, Miss T also had a very successful cooking session at our local Children's Centre. She made a lovely Apricot Bread Pudding. And it was so simple to make too. She buttered 2 slices of raisin bread, cut it into pieces and arranged in a dish. Then she added some chopped apricots. Then poured on a mix of 100ml milk, 1 egg and 25g of caster sugar (mix these 3 ingredients together in a jug first). We brought it home to pop in the oven for 30 minutes at 180C. It was so simple to make, and very yummy too! 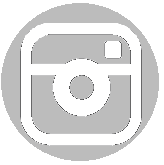 If you have any posts about cooking with your kids, old or new, pop over to Raisie Bay and add them to the linky! I've just made a new piece of art for my 'office'. Its a piece of pasta art. Why pasta? Because my 'office' is in my kitchen at home. So food seemed appropriate. I don't have a separate desk to work at, and I need to have my laptop set-up and ready so I've turned a little area of my kitchen worktop into my desk. As far as work goes, blogging is my creative outlet and although I don't earn an income from my blog because I blog as a hobby, I love it and I still need a desk to work at. Just a regular kitchen worksurface? Or the perfect desk for blogging! Where I can keep an eye on the kids! I have a few of my own quirky features on my 'desk' like my little milk jug I use to keep my pens and pencils in and another piece of art I made using an old map. So I finally have my own little space to work at. It might not be a proper desk, but it is my desk and I love it! This is my entry into the British Gas Business Desks Landscape Competition with Love Chic Living and Heart Home. Kids in the Kitchen: An epic week of cooking! As you may already know (because we keep mentioning it at every opportunity!) we are one of 8 families who are finalists in Nectar's search for the savviest family. We've been blogging over at our Nectar Savvy blog and this week was week 4 'Food and Shopping' incorporating the Sainsbury's Basics Challenge. So far, we've cooked 5 main meals using our ingredients (you can find them all here) as well as lots of banana based desserts to make sure we didn't let any of the bananas go to waste. Miss T helped make the custard for the Banana Custard dessert. She also ground the cumin with the pestle and mortar for our meat-free Bean and Mushroom burgers. D had great fun helping to make the shortbread for our Banana shortbread towers. He's also been making loads and loads of banana milkshake which you can spot him doing in our A-Z of avoiding food waste! Whilst all the dishes we've made are actually simple and straightforward to cook, we've also been doing lots of experimenting behind the scenes to make sure we are creating the very best recipes we can. So it really has been an exhausting and epic week of cooking with the Kids in the Kitchen! We are hoping for our final recipe (Day 7) on Sunday that D will cook us a meal all by himself as he has said that he would like to. So all in all a very busy week - so hopefully you'll get some inspiration from some of our recipes. I'll leave you with one of my favourite photos from this week - Our frozen banana penguins inspired by this blogpost at Reading Confetti. With last weekend being DIY weekend for us, Miss T's playhouse got a mini-makeover with a fresh lick of paint to the roof and door. So Miss T got out in the garden for a play and to explore. She looked at the apple blossom on our tiny apple tree. 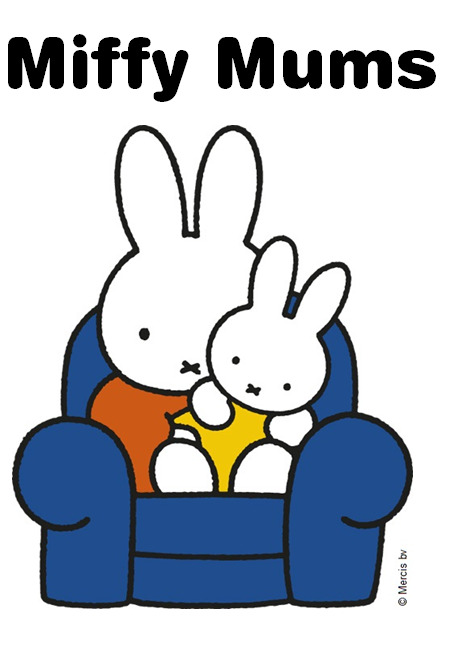 And finally time for some reading, with a trio of her favourite Miffy books; Miffy at School, Miffy's Birthday and Miffy at the Seaside. In case you're wondering why we've been a bit quiet on here lately, we are still putting the vast majority of our blogging efforts into our Nectar Savvy blog - so if you're thinking of leaving a comment here, could we urge / plead / beg you to pop over and leave a comment on one of our posts over there instead. We've written about all sorts of ways to save money whilst having lots of fun. A thought provoking post entitled When Savviness Saves lives. And how you can use Social Media to have some amazing free days out and money can't buy experiences. And a HUGE thank you to everyone who has already popped over and left comments there - we really really appreciate it!!! Respect The Pasta challenge 3: Re-respecting the Pasta! Fettuccine, meaning 'little ribbons' is one of 600 types of pasta. That's right, there are over 600 types of pasta! With that many types of pasta - it deserves to be respected. No wonder ASK Italian are on a mission to get people to #Respect The Pasta. This the third of our challenges with ASK Italian. Our task is to recreate a fettuccine recipe from the ASK Italian cookbook. The ASK Italian cookbook is available in ASK Italian restaurants and also online. ASK Italian will donate £4 of the retail price of every ASK Italian cookbook sold in their restaurants and a minimum of £1 of the retail price of every ASK Italian cookbook sold through bookshops and other third party retailers to Great Ormond Street Hospital Children's Charity. The ASK Italian cookbook combines favourite dishes from ASK Italian restaurants as well as recipes created by Chef Theo Randall and author Carla Capalbo. I love the beautiful colour photos in the recipe book. They provide real inspiration for trying out the dishes. The fresh springtime colours of the Fettuccine con Verdure recipe jumped out at me so that's the recipe we've chosen to cook from the recipe book. We made a few tiny tweaks to the recipe; we used purple sprouting broccoli instead of spinach (as that's what arrived in my veg box this week and we thought it would go well in this dish), we omitted the chilli (so the kids could enjoy it too) and where the recipe calls for 120ml water, I reduced the amount to 40ml as all that lovely veg contains sufficient moisture without having to add much more. Knowing that we could also add some of the pasta water at the end (as per Theo Randall's pasta rules) meant that I knew I could get away with using less water during cooking. The tapenade really makes this recipe taste amazing, but be aware that the amount in the recipe makes loads so you can either make less or keep it in the fridge to use up in other dishes. I actually froze the remainder of ours and plan to use it in stuffed chicken breasts, as an alternative to tomato paste on a pizza base, and as an alternative to pesto. With these bright fresh springtime colours we braved the outdoors and decided to eat al fresco for the first time this year! You can find our first challenge here and our second challenge here if you want to remind yourself of the rules for cooking pasta. You'll find the recipe for Fettuccine Con Verdure below if you want to make this dish yourself. Have fun, enjoy and remember to #RespectThePasta! 1. Blanch the green beans by dropping them into rapidly boiling water for 2 minutes. Drain, refresh under cold water and set aside. 2. Heat 1 tablespoon of oil in a saucepan over a low heat. Add the spinach leaves and wilt slowly, stirring, for 2-3 minutes. Season lightly with salt and pepper and set aside. Bring a large pan of salted water to the rolling boil for the pasta. 3. Heat the remainder of the oil in a large frying pan over a low heat. Add the chopped garlic and saute lightly. Don't let it burn. 4. Add the courgettes and saute gently for 3-4 minutes until they start to soften. Stir in the peas, sun-dried tomatoes, spinach, green beans, chilli and water and cook over a medium heat for a further 4 minutes. Stir in the basil and season with salt and pepper to taste. Keep warm while the pasta cooks. 5. Drop the fettuccine into the boiling water and cook according to the packet instructions (remember that egg pasta will cook faster than non-egg pasta). Using a mug, scoop out a cupful of the pasta cooking water and set aside. 6. Drain the fettuccine and turn them into the pan with the sauce. Cook together over a medium heat for 2-3 minutes, stirring to blend the sauce with the noodles. If the sauce seems dry, add a little of the reserved pasta cooking water. 7. Divide the pasta into hot bowls and place a spoonful of tapenade on top of each dish. Serve immediately. Put the olives, capers, garlic, basil and lemon zest into a bowl and, using a hand blender, blend until you have a smooth paste. Add the lemon juice and the olive oil and mix well. Season with black pepper to taste. Tapenade keeps well in the fridge for up to one month in an air-tight container. Disclosure: We were sent a 500g pack of ASK Italian Fettuccine and the ASK Italian cookbook, from which this recipe is reproduced with permission. 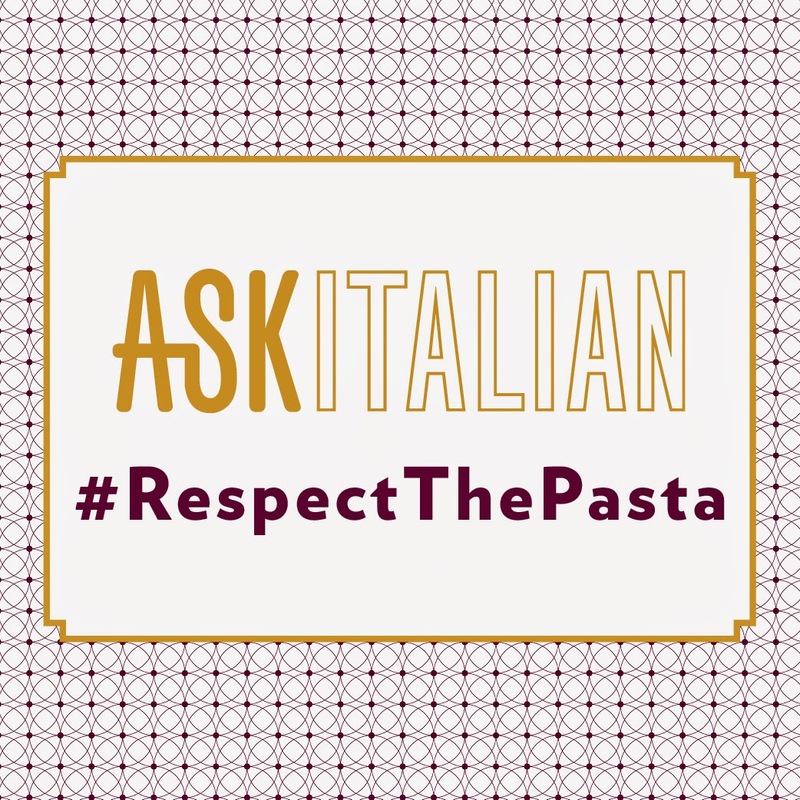 You can find out more about #RespectThePasta by following ASK Italian on Twitter and on Facebook! Kids in the Kitchen: Easter egg fun! We don't have a proper recipe to link up this week to Raisie Bay's Kids in the Kitchen, but that doesn't mean we haven't been busy in the kitchen - more about that in a mo. But first we had a trip to Sainsbury's to pick up our groceries for our Nectar Savvy challenge for next week. As one of the 8 finalists in Nectar's search for the savviest family, we have been blogging on our family blog there over the past three weeks and there's three weeks more to go! We've blogged about Leisure and Hobbies in week 1, Holidays and Activities in week 2, and we've just come to the end of week 3 where we gave our top tips relating to getting those household expenses down in the Household and DIY theme. This coming week the theme is Food and Shopping including how we get on with the Sainsbury's Basics shopping challenge. Our local store manager had prepared our groceries from the Sainsbury's Basics range and we've got to come up with seven savvy main meals using them. We're trying to be really creative and inventive with our recipes so we are really challenging ourselves a lot and hopefully the kids will help out with the cooking too. What will we cook with our ingredients? Now for this weeks Kids in the Kitchen. 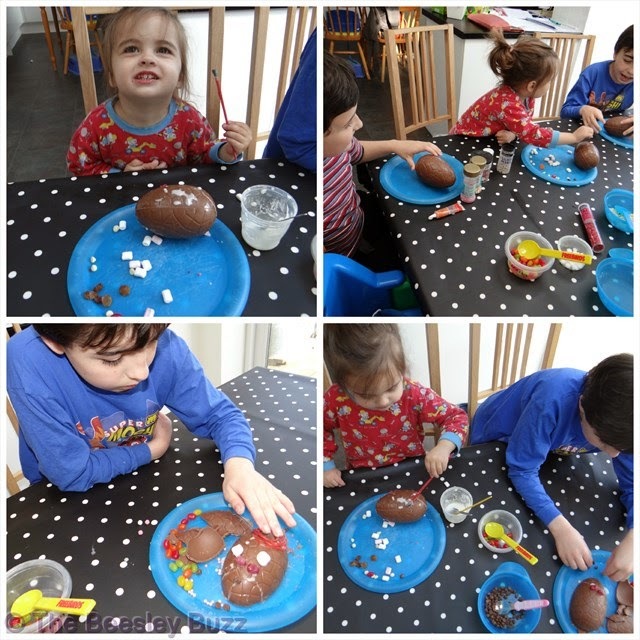 Instead of a full recipe, the kids just had a fun session in the kitchen with total free reign using icing sugar 'glue' and sweets and sprinkles to decorate some Easter eggs. It was great fun just having some downtime in the kitchen without any pressure of having to come up with an 'end result' and it proved to be a fun morning activity for all three of them. A great way to relax before the pressure of next week!!! 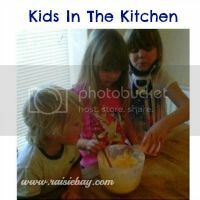 If your kids have been helping in the kitchen, why not pop over and link up with Raisie Bay's kids in the kitchen linky - old and new posts welcome. We recently reviewed a fabulous Haba ball track from The Toadstool and loved it. We had no idea that Haba also made fantastic educational games too! Having homeschooled for so long, to be honest I thought we'd already seen our fair share of educational games, and a lot of them are much of a muchness. So for me to be impressed with a game, I'd have to be REALLY impressed. And I was! The Haba Secret Code 13+4 game comprises of a game board, 6 wooden dice, 4 wooden player pieces, 15 number tiles and an instruction booklet. All made to Haba's high quality standards. We especially loved the wooden player pieces - they are unique colourful pieces and its great to have such sturdy pieces. The game is suitable for 2-4 players and for ages 8 and upwards. Because of the way the game works it is fun for adults to join in with too as it can provide a challenge at any age. The board game is illustrated as a museum and the players are secret agents who have broken into the museum with the aim of being the first to reach the precious 'Amun Re' mask. To do so they must first cross the 'light barriers'. Each light barrier is allocated a number at the beginning of the game by placing the number tiles on them. The number tiles are double-sided giving plenty of different numbers to use. Factor in that there are 6 dice to use too and the huge potential of this game can be seen as players will be challenged each time they play to practise their arithmetic as they won't be able to simply memorise answers. As each number tile 'light barrier' is approached, the player throws all 6 dice. Then they need to be able to get that number by using a mathematical calculation using any of the numbers on the dice. You can use addition, subtraction, multiplication and division (or a combination of any of these!). If they can figure out a way of calculating the number on the number tile light barrier, they can jump over it ready to tackle the next one. That same player continues to throw any remaining dice (which they haven't used in their calculations) until such time as they cannot manage to calculate any more of the light barrier codes. Play then passes to the next player. The game feels fast paced and exciting. I would describe it as challenging but not tricky because the beauty of it is that children can use the types of calculations they are already familiar with whilst also developing problem solving abilities as they try to see if there are alternative ways of getting to the answer they need, which will sometimes mean using operations that they are less familiar with. 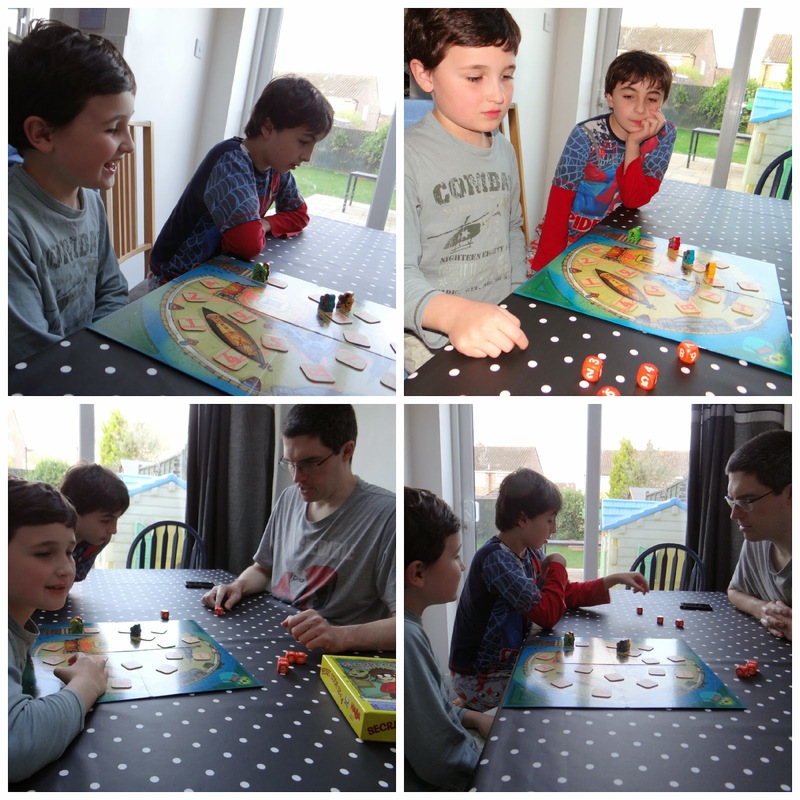 The whole game takes around 15 minutes to play making it a favourite for all as it doesn't drag on (like some board games can!) and mum and dad can feel satisfied that they've had some good quality time with the children playing an educational game that is first and foremost fun and one that the kids have asked to play over and over again. I cannot emphasise just how highly I would recommend this game. It is great for children who love maths because of all the potential possibilites of number combinations and equations, and also brilliant for reluctant learners as it is truly engaging and fun with sums that can be done quite simply too. Because it doesn't rely on pre-set sums, it remains interesting and lends itself well to different ages and abilities playing together. At a great value price this would make an ideal birthday gift for friends or a great buy for your own children to enjoy with each other for years to come as a fun family game. You can follow The Toadstool on facebook and twitter to hear about all their latest releases, competitions and #Toadtests. Disclosure: We were sent this game to review for The Toadstool. All opinions are our own. April 2014 Draw With Me: Family and Miss T at Two! 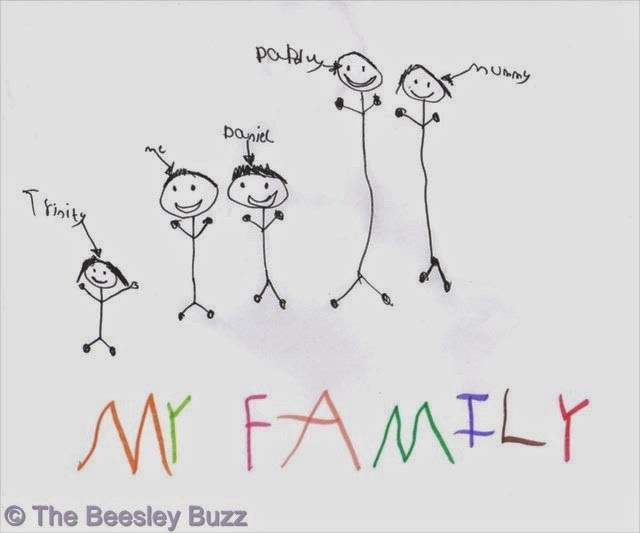 All 3 of the kids got involved in this months Draw With Me with their pictures on the theme of Family. I absolutely love 8 year old D's picture of 'mum and dad'. 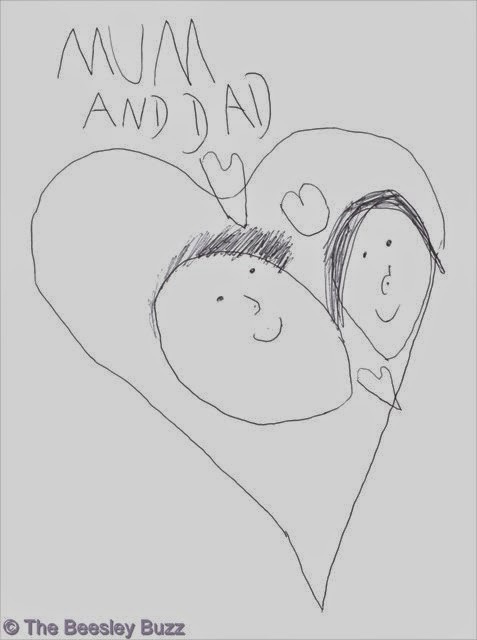 He often notices when we argue and he really doesn't like that, so it was really special to see him draw a picture of us two with hearts on it. It means that either he knows that mummy and daddy do truly love each other, or it is wishful thinking that we would argue less and show that we love each other more! She really has so many words now that it is impossible to keep track of new ones. We love it when she comes to find us around the house calling out 'whe-ah-yoo' (where are you). She had a habit of pinching the boys' toys and says 'Tinty's' and tries to keep them for herself! She gets excited at the strangest things like an outing to the bank - she started saying 'bank' 'bank' and dancing around excitedly. She tells us to 'top it' (stop it) whenever we sing or dance. She loves Poppet from Moshi Monsters and often asks to wear her Poppet dress. She is generally mega adorable and cute and her brothers adore her more than ever!!! We have been so busy with our blogging over at our Nectar Savvy blog (please do pop by and say hi to us there!) that I nearly didn't get around to joining in with my favourite linky, Raisie Bay's Kids in the Kitchen. This week I wanted to bake something we've never baked before, Iced Buns. I used the recipe I found on the Delicious magazine website for Tear 'n' Share sticky iced buns. So there's no point replicating the recipe here as it has brilliant instructions there for making them. I'll just let you know how we got on. We used a mixer with a dough hook for the initial mixing of the dough. Firstly, I have a confession to make. I used a little trick that I used to use when the boys were little if I needed them to be involved in the cooking but couldn't risk things going wrong. I gave Miss T some flour and water to combine into her own dough so whilst I was kneading the iced bun dough, she was kneading the separate dough which would then be discreetly disposed of. I tell the boys about it now and they totally understand why I would sometimes do that and they don't hold any grudges about it - so I figured Miss T won't mind either. And her hands got just as messy as mine! 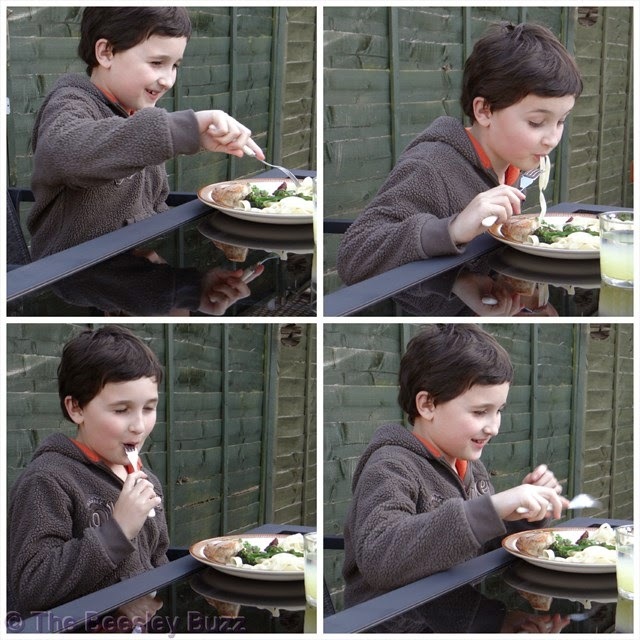 Hopefully by now, you'll know how I feel about how important it is to get kids involved in cookery and how they often get the opportunity to do 'proper' cooking, so I hope you'll forgive me for this little cheat. You see, I had to stay extra focused on the iced buns - Even then I nearly forgot about the second proving - but thankfully remembered just in time. It is a pretty straightforward recipe and iced buns seem to have a lot less butter and sugar in than ordinary cakes, but then you need loads of icing sugar to make the icing - so perhaps not so healthy after all. A good stage for kids to help out with would be the icing stage. You could always do it Paul Hollywood style where you dunk the top of the buns in a large bowl of icing and then smooth over with a finger. I tried to do this, but my icing was a bit runny so they've ended up a bit messy. And just as I was feeling guilty that it was mainly me rather than the kids cooking in the kitchen this week, I found the photos of what the boys got up to just after me and Miss T made the iced buns. They found one of D's weekend boxes which had a Banana split recipe and without even checking if we had the right ingredients, they just got started on it themselves. So they ended up having to improvise a little using a petit filous fromage frais instead of plain yogurt and using frozen berries instead of fresh, but they seemed to like the creation that they ended up with. Thankfully we did have bananas otherwise that would have been interesting - Banana split without bananas - hmm?